Soft, pliable modeling material that is non-toxic and safe for young children even if ingested. It resists crumbling, doesn't leave a residue on hands or most surfaces and will not spot or stain. 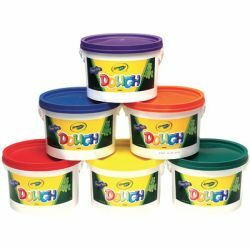 Set includes Red, Blue, Green, Purple, Orange and Yellow in 3lb tubs.